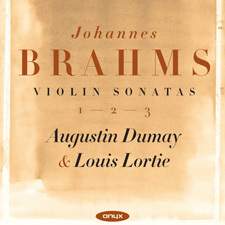 Though the Violin Sonata no.1 in G major is the first of the three by Brahms that we know today, he had in fact written three (possibly four) earlier violin sonatas which he carefully destroyed at some time. His op.78 is sometimes referred to as the ‘Rain’ Sonata – not principally because of the continual semiquavers of the last movement reminiscent of a gentle downpour, but because its rondo theme is related to Brahms’s settings of two ‘rain poems’ by his close friend the poet Klaus Groth (1819–1899), Regenlied (‘Rain Song’) and Nachklang (‘Distant echo’), op.59 nos. 3 & 4 respectively published in 1873: ‘Cascade, rain, cascade down,/wake for me those dreams again/that I dreamed in childhood...’.